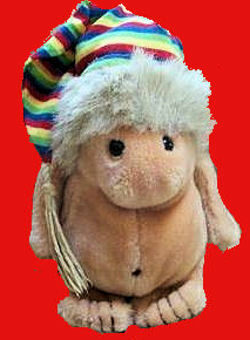 I am looking for a GUND Noah Gnome plush toy that I bought for my son in 1983 or 1984. It is beige with a rainbow long hat, and he has long arms. The stuffed toy was only about 7 or 8 inches tall, but kinda chunky. My son loved “baby Noah”. He loved this gnome so much that he almost took it to school. I bought two. I put one away to one day give him it for his own child. It was unfortunately lost in moving. His wife is pregnant, and I will do anything to find another one. I have been looking for about 2 years. I know it’s out there. I have seen it on eBay but never soon enough – always sold. Please help me find one before June. I sent your link to her, too. Surely she’ll be able to get this one!!! ebay #160792194255 Bidding begun but 4 days to go. Good luck! Hi I am looking for one of these little guys if anyone has one. It doesn’t matter what state they are in I am willing to repair. This was my favorite childhood stuffed animal, I got it when I was 1 and truly would love to find another one. I saw one on ebay but it’s $40. I hope to find one for under $20. If anyone has seen one or is selling one let me know. Thanks so much!